Under Floor Plans in the editing section of your 360-degree-tour, you can add a floor plan to each area of your tour and place markers to position the assigned 360-degree-images in the floor plan. Note: Floor plans can be uploaded as JPEG or PDF files. 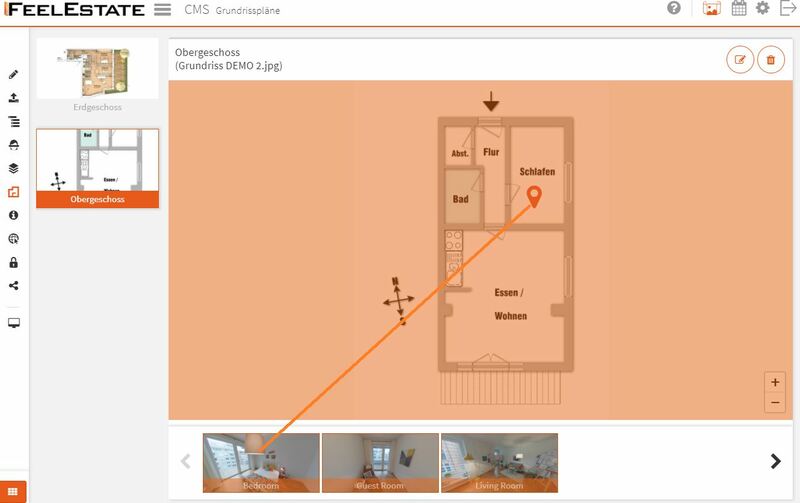 Floor plans are displayed on the right side of your 360-degree-tour and show all of the assigned images as well as the current position of the user. First, select the area from the list on the left to which you want to add a floor plan. Wählen Sie einen Bereich aus der Liste aus. Now click on the floor plan field on the right side and select a floor plan file ( .JPEG or .PDF) on from your computer. You can also drag the floor plan file from your desktop to the floor plan field to upload it. After the floor plan was uploaded, it will be displayed in the selected area. [Change Floor Plan] – Uses this button if you would like replace the current floor plan and upload another file. 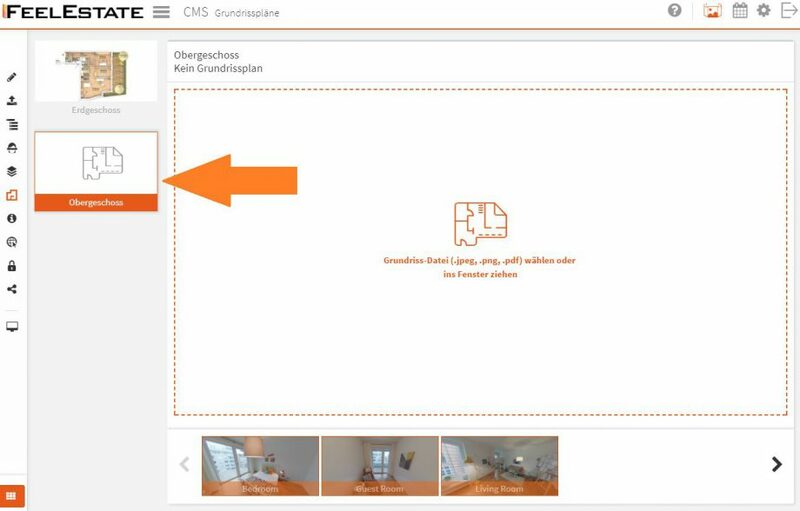 [Delete Floor Plan] – Use this button to remove the floor plan from the selected area. After adding a floor plan to an area, you can now position the 360-degree-images of this area in the floor plan. 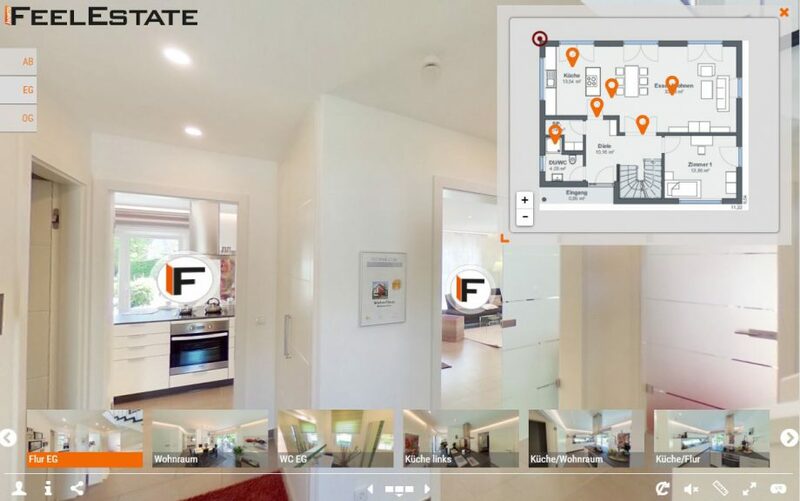 This way the users in your 360-degree-tour can see their current position in the floor plan and navigate between rooms by clicking on the colored markers in the floor plan. In order to position a 360-degree-image in the floor plan, use your mouse to drag it into from the list of “un-positioned” images below the floor plan to the appropriate position in the floor plan where the 360-degree-images was captured. The list of pictures below the floor plan shows only 360-degree-images of the selected area that were not yet positioned in the floor plan. To remove a 360-degree-images from the floor plan, simply drag the maker out of the floor plan image using your mouse. 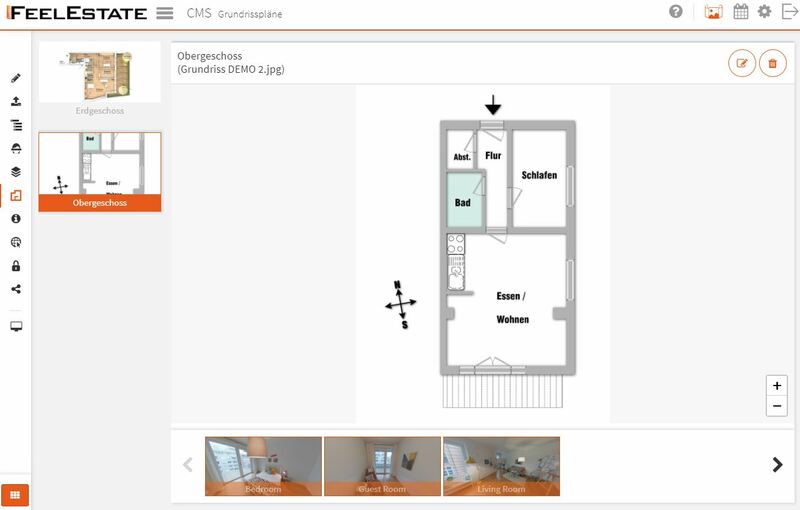 After the image was removed from the floor plan, it will appear in the list of “un-positioned” images below the floor plan again.